This is a very elegant scent bottle. It is the teardrop bottle (Flacon de Goutte) initially made by Pocket et du Courval for Guerlain's range of eaux de toilette including Fleur de Feu. It has a ground glass frosted stopper made as 2 cockle shells and it has the newsprint dolphin label depicting 2 dolphins and printed "Eau de Toilette de Guerlain 68 Champs-Elysees Paris Fleur de Feu". 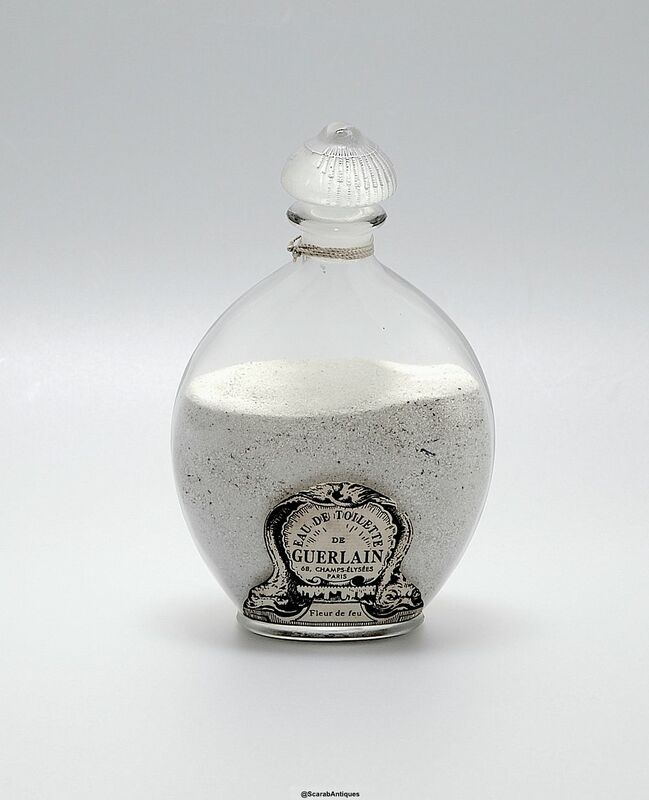 The base of the bottle is impressed "Guerlain" It has lost its contents but at some stage has been partially filled with sand. The silk tying threads remain around the neck. Fleur de Feu (Flower of Fire) was created by Jacques Guerlain in 1948. This was Guerlain’s first perfume after the World War II hence the name Fleur de Feu coming from the idea of flowers rising from the flames – like a phoenix. It was also created to celebrate Guerlain's 120th anniversary. It is now discontinued but appears that it was still being sold in 1959.